Have some old overdue fines at the library? Well here's your chance to get rid of them. For every non-pershiable food item or personal care product you donate , you get $5 worth of fines taken off your account. This does not apply to lost books. 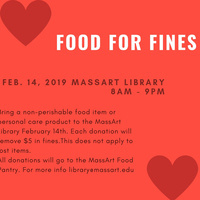 All food and personal care products will be donated to the MassArt food pantry. Get rid of your fines and do some good at the same time.! For more information e-mail library@massart.edu.